From highly processed white wax to candle wax, beekeepers wax, and even brood wax, there are uses for every type of wax bees produce. The production of beeswax in the hive is very costly, however. It takes about 8.4 pounds of honey to create 1 pound of beeswax. This honey could be used to feed the nonforaging bees or it could be saved for times when nectar is in short supply. For this reason, beeswax is often chewed off in one spot and placed where it is needed. The reusing of old comb also contributes to the color, since it may have been used for brood rearing or honey storage and may contain cocoon remains, propolis, or pollen. How Do We Get Beeswax? Most of the wax that is commercially available is made from what beekeepers call “cappings.” When bees produce honey, the foraging bee collects the nectar and stores it in one of her two stomachs (one stomach is reserved for honey collection and the other for personal digestion). The nectar in the honey stomach mixes with enzymes and when the bee returns to the hive she places it into a waiting cell. As more cells are filled with nectar, bees fan their wings to create airflow through the hive, which helps dry out the nectar. By lowering the moisture content of the nectar to less than 19 percent, the bees are ensuring that the honey will not spoil. Then the bees systematically work their way across frames and across honey boxes, capping off each cell to prevent additional moisture loss. When beekeepers harvest the honey, they remove the frames with honey from the hive and bring them to the honey house for processing. Since all the honey cells have wax caps on them, just adding the frames to a honey extractor would yield no honey. So beekeepers first remove the wax cap using either a hot knife or some sort of flail. The wax cappings are added to a capping tank and the frames are placed into the extractor to spin out the honey. What a beekeeper does with the wax cappings depends to a certain degree on how many hives he has. In most cases, heat is applied to the cappings, allowing the honey and wax to liquefy and separate into two layers — honey on the bottom and wax on the top. After several more filterings to remove residual honey and miscellaneous bee parts, the wax looks pretty clean and is generally ready to go. Beekeepers also melt down old honey and brood comb in order to install clean wax and do general maintenance on the frames. Over the years, brood comb will have raised multiple cycles of bees and the cocoon from the larvae stage will have turned the comb a dark brown. Also, potential pathogens may have been introduced either from the environment or from bees carrying the pathogen with them. These pathogens can decimate a hive rather quickly, which is why beekeepers often replace the old brood comb with clean wax. While wax from cappings and honey combs is fairly pure, the wax from brood combs contains a wide assortment of “stuff” which may include cocoons from both bees and wax moths, excrement from bee larvae, mites, pollen, propolis, and bee parts. All this extra stuff is called “slum gum,” and removing the slum gum from the wax is a more involved process. One method is to put the brood combs into burlap sacks and then add the bag to a hot water bath. The melted wax will flow through the burlap and the slum gum will stay in the bag. Beekeepers then press the burlap sacks to release the rest of the trapped wax from the slum gum. Once most of the wax is pressed out, the slum gum is discarded and the wax is molded into 30–50 lb blocks. The resulting wax is usually significantly darker than the cappings wax, ranging from light brown to almost black. If this wax were to be used for something such as candles, it would give off an unpleasant smell. A lot of beekeepers turn this wax in to bee supply stores for credit toward “clean” wax or wax that has already been turned into foundation for inclusion into new frames. The bee supply stores ship this dark wax to commercial wax processing operations that have specialized equipment with carbon filters that remove the color from the wax. This process is far better than how wax was filtered in the past, when it was bleached using noxious chemicals to remove the color. Most of the white wax available today is achieved naturally using carbon filters instead of chemicals. One drawback to the heavily refined, highly filtered wax is that the aroma and charm of beeswax (as well as many of its unique health advantages) actually come from the natural “contaminants,” including honey, propolis, and pollen. 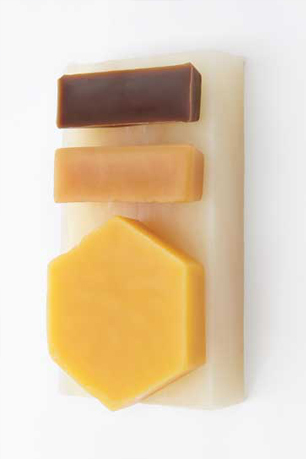 Bleaching or advanced refining of beeswax to remove its color and fragrance yields a product that is a bit bland. For things such as candles, especially pillar candles, the residual honey in the wax causes the wax to burn unevenly, clogging the wick. The best way to get the last of the honey out of the wax is to allow it to clarify in a heated double boiler or wax tank. Admittedly, this task is easier to accomplish with the wax tank than a double boiler, since the wax must remain in a liquid state for quite a while until all the honey has settled to the bottom. I usually let mine settle for a couple days. The best way to determine if it is done is by checking the clarity of the wax. When it is first melted, it has murkiness to it. As the honey settles, the wax begins to clarify. When the wax is clear, filter it through a clean piece of felt cloth and pour into molds to divide the wax into useable portions. I usually do a variety of different sizes, from 1-ounce ingots up to 10–20 pound blocks that store easily, but are still small enough to fit into my wax melter. This ensures that I have the right size for whatever I am making. The resulting wax is still yellow and retains the signature honeylike scent, although the filtering may have lightened up the wax slightly. My first wax processing experience was while helping another beekeeper with his honey extracting. His operation seemed huge to me at the time (he maintains around 1,200 colonies), but I have learned that in comparison to other commercial operations, his is probably on the smaller side. There are some commercial beekeeping operations that maintain upwards of 50,000 colonies. There is very little difference between how these two types of beekeepers do their wax processing, except that the large-scale operations may have a more automated version of what I experienced. The first step in the process is to place the honey frames into a machine that cuts the cap from the top of the honey cells. The removed cappings are funneled into a trough where they are pushed through a very coarse screen before entering the processing area. The frames are moved to the honey extractor. The wax processing area may have either a centrifuge where the honey is flung to the outside, rendering the cappings virtually free of honey, or a heated chamber with a series of baffles that separate the honey from the wax. The wax that results from either of these processes is generally where the beekeepers stop. It is usually a really nice yellowish wax with a lovely honeylike smell. However, there is still some honey left in the wax. It may not be all that noticeable, but it is there. For some applications, such as lip balms, it is not a problem to a have a bit of honey in the wax, but for other applications, cleaner wax is needed. This is the wax that comes from melting down old brood comb. Brood comb is usually replaced on a three- to five-year cycle. After the hive has reared multiple batches of brood on a frame of wax, the wax cells keep getting smaller and smaller, since the cocoon material remains. In the wild, Mother Nature has seen to the renewal of this comb, as the wax moth larvae loves to eat the brood comb. The moths are voracious eaters and can decimate a box of stored combs over the winter months, forcing the bees to build up the cell walls again before the queen can lay eggs into that space. For kept bees, beekeepers take on the role of the wax moth larvae by removing the old wax and replacing it with fresh wax foundation. The process of rendering the wax from the cocoons, propolis, and other items in the brood comb is an arduous one. All these additional elements need to be filtered out before the wax itself can be cleaned. To do this, most beekeepers put the wax into burlap sacks, stacking press plates in between, and heat the whole works up to melt the wax. Once the wax is melted, the plates are pressed to release whatever wax remains in the slum gum and then the wax is strained off the top. The wax that comes from this process is usually really dark. Although a lot of the bigger particles of propolis, cocoon, and slum gum are removed in this process, the microscopic bits still remain. Over time, these bits actually tint the wax, so even filtering the wax will only lighten it slightly. Although it may not look and smell as nice as yellow cappings wax, it does have its favored applications. It works really well for darker wood finishes. The light wax can have a “glazing” effect over time that is diminished when using the darker colored wax. It also works well on darker leathers. I use our dark wax to condition and polish my shoes. We also supply a local blacksmith with some dark wax. He prefers the darkest wax we have, since he uses it to seal and protect his wrought iron pieces. Before I got into encaustic painting, I had no use for anything besides yellow wax. I loved the color, the scent, everything! So when I started making my first batch of encaustic medium, I used what I had on hand. I figured that I could make the yellow color part of my “signature” look. WRONG! Aside from my inept skills as an encaustic artist, it looked horrible. The colors were muddy and didn’t flow as well as I had envisioned, so I did some research on “white” beeswax. My hope was that I would be able to remove some of the color from the wax myself. First I tried bleaching it in the sun. That works, but only to a certain degree. Sun does lighten the color of the wax, but the presence of microscopic bits of propolis, slum gum, and possibly honey added color that could not be completely bleached by the sun. To remove the inherent colorants in the wax, it needs to undergo a different process that most at home cannot achieve. In the past, white wax was treated chemically to separate out the propolis and other “contaminants.” This process yielded a nice, white wax, but traces of some of the chemicals remained. Not good! Today, most of the white wax is not treated chemically. It is run through a series of super fine filters that remove the “contaminants,” without the addition of harsh chemicals. The color of the resultant wax is very light and as close to white as possible, but there is also a translucency that is not available in the yellow waxes. This translucency is what makes it great to use for encaustics. Also, since a lot of the “contaminants” are what give the wax not only its signature color and smell, but also its myriad health benefits, white wax is not my preference for use on the skin.